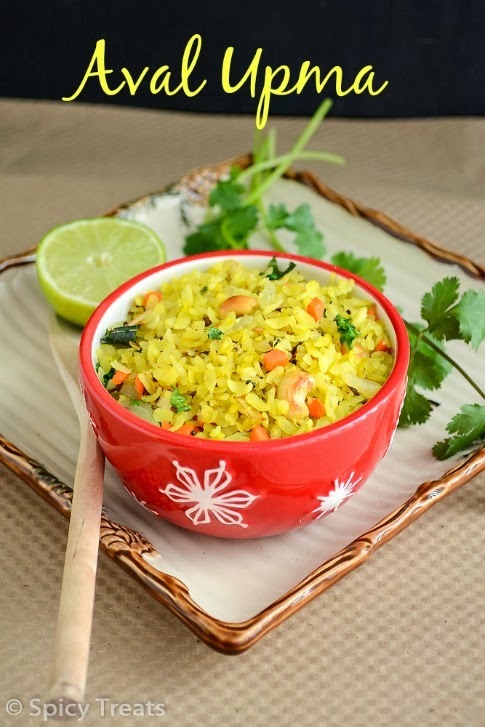 Spicy Treats: Poha upma / Aval upma ~ Easy breakfast Recipes! 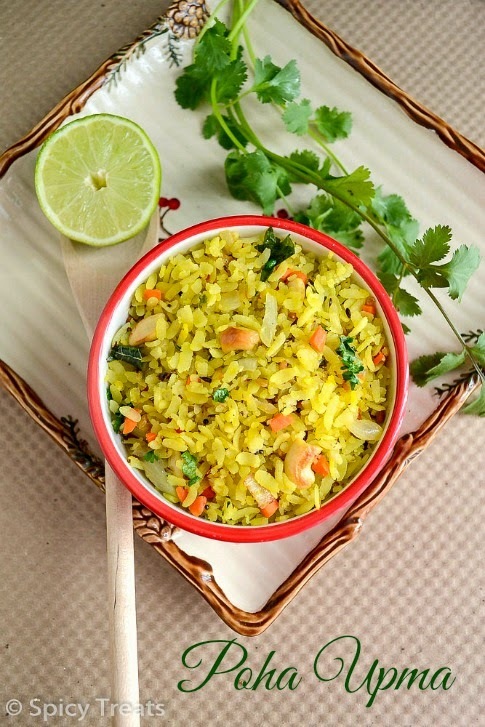 Aval Upma is one of the easiest breakfast recipe that can be done in a jiffy. Me & my kids most favorite breakfast. I even make this aval upma for our evening snack, make it little spicy with ground chillies, would be perfect with a warm drink. Only thing, this Aval upma should be served immediately, if its cooled it will be chewy. So this Aval upma should be served piping hot. 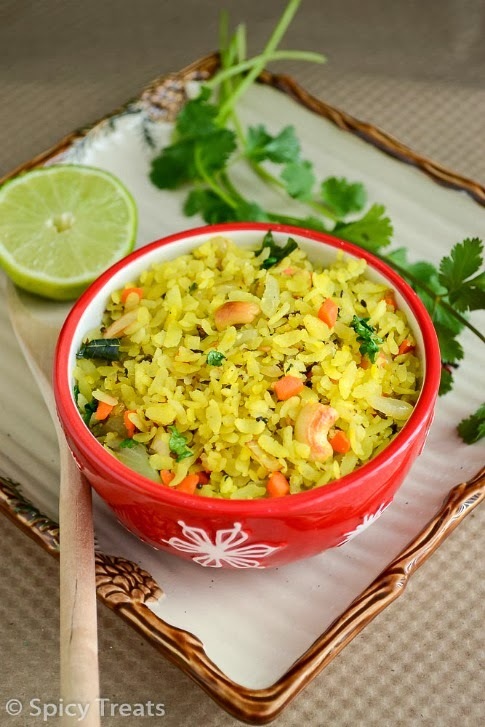 To make it even more filling and healthy you can add finely chopped veggies like carrot, beans, cabbage & even peas also. Here i added only carrot. I even tried Broccoli Poha, Spinach Poha, Cranberry Pickled Poha, Aloo Poha & for more varieties click Here. Wash and drain it and keep aside. heat oil in a wok and add mustard seeds and allow it to splutter, then add chana dal, urad dal and cashew nuts fry till golden brown. Then add chopped onions,ground green chillies, ginger, carrot and curry leaves, saute for 2 minutes or until onion turns soft and light brown. After that add poha and turmeric powder, enough salt and stir fry 1-2 minutes in low-medium heat. Finally Add some finely chopped coriander leaves, mix well. That's it...Tasty Aval Upma ready. Serve hot. If desired add few drops of lemon juice to the upma before serving. Do not soak aval/poha in water for long time. Heat oil in a pan, then wash poha and drain it and keep aside. 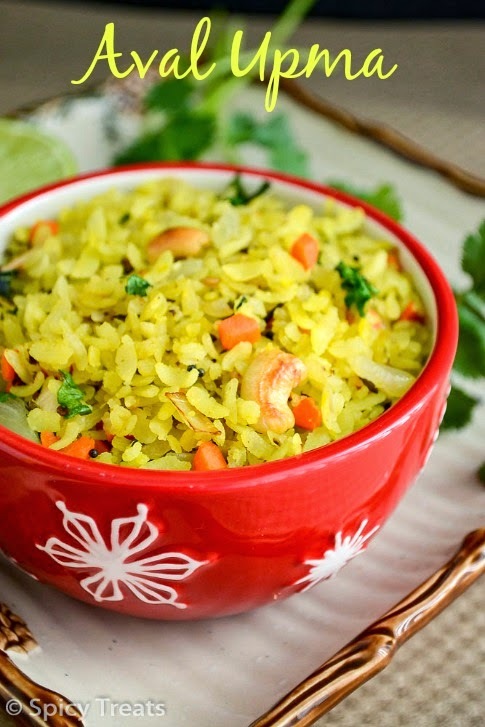 But if you want too soft poha upma then soak it water for 2 minutes then drain well and keep aside.